Bonjour! Yes, it's French food … or should I say cuisine this time. Please look out your French style dishes and link them in. I am sure there are lots of good ones out there. Feel free to add links to posts about French cookbooks too. Just put your name and the name of the dish into the first box and copy the url for your post into the second one. I'll be pinning the links to this Pinboard as quickly as I can to make it easy for you to select which links to visit. My soup isn't technically a "French" recipe, but does use French Green Lentils so I hope that's close enough. I just picked up another bag of French green lentils this morning at the farmer's market--what a coincidence! Thanks Carole for the French theme and for inviting me. That really is French LOL!!!! Happy Friday to all!! Perfect timing for this one! I just linked in. At first I was scared I didn't have any recipes, then I looked around for anything that sounded French :) Thanks so much for hosting Carole, these link ups are always so much fun! Ooh la la! What a fun theme! Thanks for the invite! I belong to a French cooking group so if any one is interested in checking out the recipes I've made or join our group check out my "French Friday's with Dorie" posts. Thanks for the party. Thanks, Carole, for the fun themes. This post on Salad Niçoise also has a bit of history and variations. Enjoy! Great choice for this week! We definitely need to try some of these - duck confit, beef bourguignon, boulangere potatoes - just to name a few! Oo la la! Thank you, Carole! Fun theme. Excellente idée! I speak french, but I'm just French's little cousin here in Quebec, Canada :D We eat a lot of french cuisine and I shared my recipe for Creme Brulee Maple Apple Tart! So delicious! Thank you for telling me about your great link party this week Carole! My contribution is Boeuf en Daube a la Camargue. Thank you so much Carole! I love French cuisine! I've shared three of my favorite French Pastries: The cream puff, the eclair, and the galette de rois! Some of these recipes look quite interesting. Thanks! Yes, glad I had something to share! I've thrown in my version of Boeuf Bourguignon. Enjoy! Thank you so much for hosting the link party again. I love French food, the Roquefort Tarte is one of the first recipes I put on my site! Thankfully my photography has improved. Carole, I put in the first thing that came to mind - Boeuf Bourguignon, adapted from Julia Child's recipe. I've taken out a few time-consuming steps without taking out any flavor! My favourite food of all time. Thanks Carole! This soup is a staple in my household. I'm amazed every time by how good it is! Sorry, Carole, I think I messed up the URL. I should have cut and pasted! This is a fun theme this week...thanks! Thanks for the reminder Carole. I added fougasse aux herbes de provence! Hey Carole. I've linked my baguettes - because a french table isn't complete without one... or two. Thanks again. French cuisine is divine! Linked some of my favourites. We use a lot of French-influenced techniques. Today I shared our "how-to" for duck roulade. Enjoy! Some very interesting sounding recipes here! Thanks for the invite. Didn't think I had anything french on my blog, but then realized, I did, so I shared. Thanks for hosting this, it's been fun. Hi all, hope you like my eclairs! Carole, so sorry put an expired (read bad) link as #105. I just put the correct one on in #106. YIKES. Holy cow, this is my kinda page! I see many goodies up here to try. Thanks for inviting me and sharing this theme. Personally, I don't know much about French food, but I do know a little old French lady who gave me here recipe for the basic crepe. So I've linked up my version. :) Thanks for hosting and have a wonderful weekend! Always an honor, Carole. Hope someone enjoys the comforting croque-monsieur. Thanks! I submitted my Blueberry Pie Yogurt Parfaits!! Have a Happy weekend! Thanks for requesting! J'adore French desserts. Just posted my potato pave & saffron almond sauce. These all look yummy! I am sharing a French Style Carrot Salad with Grapes and Sunflower Seeds. Have a great weekend and I look forward to sharing again in the future! Carole, Thank you for sharing these wonderful recipes! I adore French food, and this will give me tons of inspiration. I'm bookmarking your site and will be back often :-). I have macaroons, pate, cow au vin, and others but my favorite French recipe is socca. Quick, easy , versatile and delicious. Although my pic isn't the greatest. Thanks' Carole for hosting this. Thanks Carole for having directed me to this site!! 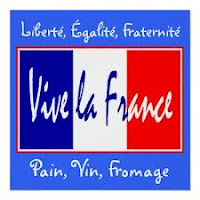 I can learn some new French recipes, and I am already seeing so many other wonderful recipes and blogs. Wish you the best! Thanks for all these great recipes! Thanks for featuring my blog Carole!